Hello! 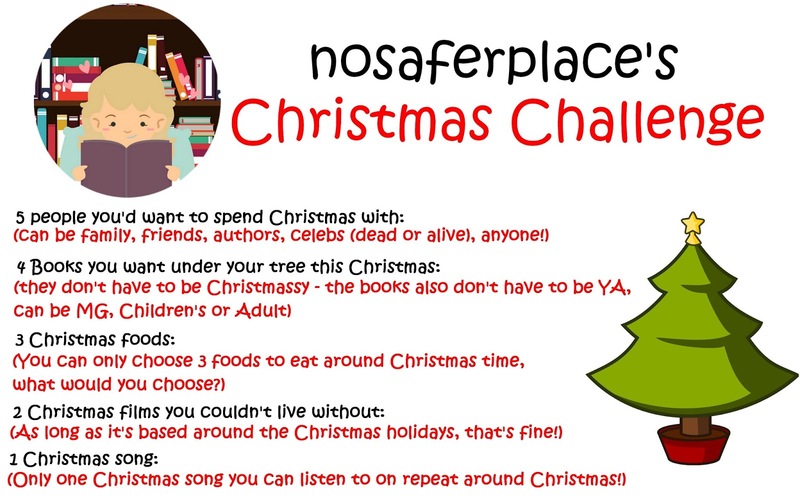 Here is my nosaferplace blogmas fun. Warning – I love Christmas. The real – and very lucky – answer is that I pretty much get to spend Christmas with all the people I most want. So I’d use my extra invites for East 17 to pop-round around to do a quick but rousing rendition of Stay Another Day. It would be too awkward if they stayed for longer than that, as our flat is quite small, and those four puffa jackets would probably fill 50% of it.The fifth person could maybe be someone to both provide – and clear up – the obligatory fake snow that would need to be thrown during the sing-a-long. This is a little easier, as they’ve been on my list for ages. Freshers, Songs About Us and a pre-order of The Light Jar. Could I also please re-wrap and re-read my copy of I’ll Be Home For Christmas? Brussel sprouts, Quality Street and the yet-to-be-perfected veggie Pigs-In-Blankets. All supplies would need to be unlimited so they could be accompanied by the painful Christmas feeling of wondering why you’re still eating them, when you feel like you might pop. The two choices are weird ones for my normal taste in films, but Christmas does something weird to me. Elf and The Nativity. Mistletoe and Wine – Cliff (only one name needed). It’s all about that harmony bit.